Food in Paris can be overwhelming. Particularly after a week of breakfasting on croissants, lunching on baguette and pâtés, and dining on delicious cuts of game birds, and pigs cooked in clarified butter and fortified with bacon jus. And crème fraiche topped pastries in between meals. 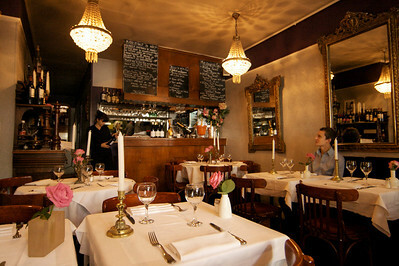 How can you not eat well in Paris? But you can be also be overwhelmed by the craft – thousand layers in Pierre Hermes’ mille-feuille, minced pig’s feet stuffed in small potatoes at Christian Constants’ Les Cocottes, Joël Robuchon’s langoustini ravioli with truffle sauce to name a few. 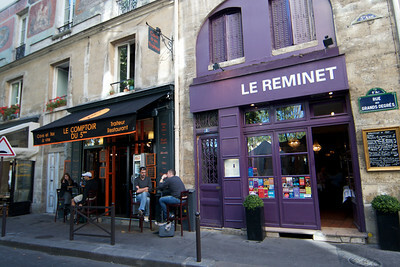 Le Reminet by Seine, near Notre Dame, is a tiny restaurant where we ate one of the most delicious meals this Paris trip. And we could have been eating in San Francisco. Indeed this is a compliment. Good Californian cuisine uses freshest of ingredients and elevates them to the best the ingredients can be. But it is less about the cleverness of the craft but more about the harmony of intense flavors to highlight the ingredients. It is simple and playful and is often accompanied with a twist. Some people refer to this twist as innovation but it feels like dissidence to me. And, sometimes the dissidence results in cacophony and sometimes in orchestra. We decided to go straight for the main courses. One was pan fried skate and the other duck breast. 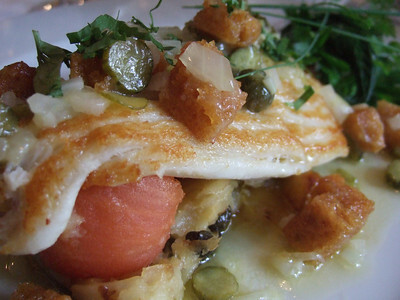 Let me start with the pan fried skate. It was fried in a neutral oil and served over a sweet potato puree. The fish was perfectly flaky, crispy on the outside and soft inside. The sauce was a light one made of cornichons, capers, and sweet syrup soaked fried croutons. There were bits of saltiness of capers and tartness of cornichons playing along with the twist in the dish, the sweetness of the fried croutons. All that playfulness of tastes and textures on the plate made each bite taste slightly different. The plate ended with a sigh. The duck arrived showing off the crispy skin. It was paired with melted onions flavored with garam masala. Sauce on the plate was more traditional one with red wine and balsamic vinegar. Again, the duck breast was perfectly cooked. Very crisp skin, rare in the center. The onion pairing was remarkable. Garam masala, the twist in this dish, is the aromatic combination of spices from Indian sub-continent. Every family in India has its own recipe for the combination but basic ingredients are ceylon cinnamon, cloves, cardamom, black pepper, cumin, and coriander. 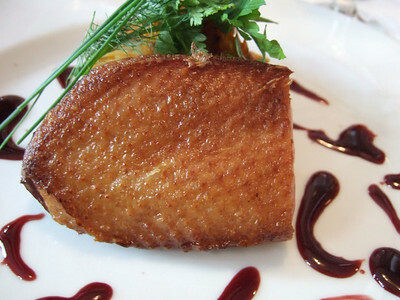 Game birds used to be a common food for the Royalty in India and duck roasted with garam masala has existed in Indian cuisine for perhaps a thousand years. So, the combination shouldn’t be surprising if you are sitting down for a meal in an upscale Indian restaurant in London. It was a surprise in Paris and a pleasant one. 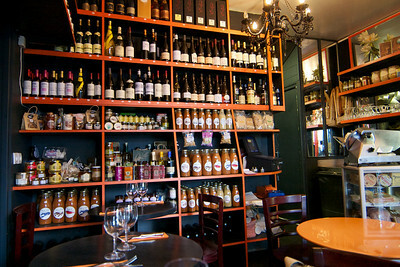 Le Reminet is next to a lovely wine bar. If you like sitting out in the open, I highly recommend drinking here before or after your lunch. Follow up the lunch by walking over to Île de la Cité and taking a river ferry ride and then coming back to the wine bar, and drinking some more. For desserts, walk through the Latin quarter, until you see the jalebis.